Stars are mourning the death of music icon David Bowie. The "Space Oddity" singer died at age 69 Sunday following an 18-month battle with cancer. Bowie was one of the music influential artists of the past 50 years, known for making hits like "Changes," "Moonage Daydream," "Heroes," "Young Americans," "Ziggy Stardust," "Rebel, Rebel," "Five Years," "Modern Love" and "The Man Who Sold the World." The two-time Grammy winner released what would ultimately become his final album, Blackstar, on his 69th birthday Friday. Bowie is survived by two children, Duncan Jones and Alexandria "Lexi" Zahra Jones, as well as his wife Iman, whom he had been married to since Apr. 24, 1992. The British musician's death was announced via his official Facebook page late Sunday night. "January 10 2016 - David Bowie died peacefully today surrounded by his family after a courageous 18 month battle with cancer," an official statement informed his 6.23 million followers. "While many of you will share in this loss, we ask that you respect the family's privacy during their time of grief." News of Bowie's death made waves throughout Hollywood, and musicians like Iggy Pop, Gene Simmons, Kanye West and Pharrell Williams took to social media to mourn the music legend. Other celebrities who had been touched by his music, including retired soccer player David Beckham, British Prime Minister David Cameron and Golden Globe winner Kate Hudson, expressed their grief as well. "Very sad news to wake up to on this raining morning. David was a great star and I treasure the moments we had together. His music played a very strong part in British musical history and I'm proud to think of the huge influence he has had on people all around the world," The Beatles' Paul McCartney wrote on his website Monday. "I send my deepest sympathies to his family and will always remember the great laughs we had through the years. His star will shine in the sky forever." Meanwhile, Yoko Ono, love of the late John Lennon, issued a statement via Facebook Monday. "John and David respected each other. They were well matched in intellect and talent. As John and I had very few friends we felt David was as close as family. After John died, David was always there for [my son] Sean and me. When Sean was at boarding school in Switzerland, David would pick him up and take him on trips to museums and let Sean hang out at his recording studio in Geneva," she wrote. "For Sean this is losing another father figure. It will be hard for him, I know. But we have some sweet memories which will stay with us forever." Meanwhile, rocker Billy Corgan said, "When a true star blinks out, the sky looks different, and never feels the same." In a statement published via their band's website, members of The Rolling Stones said they "are shocked and deeply saddened to hear of the death of our dear friend David Bowie. As well as being a wonderful and kind man, he was an extraordinary artist, and a true original." In a separate statement, frontman Mick Jagger added, "David was always an inspiration to me and a true original. He was wonderfully shameless in his work we had so many good times together. He was my friend. I will never forget him." Columbia Records also released a statement to E! 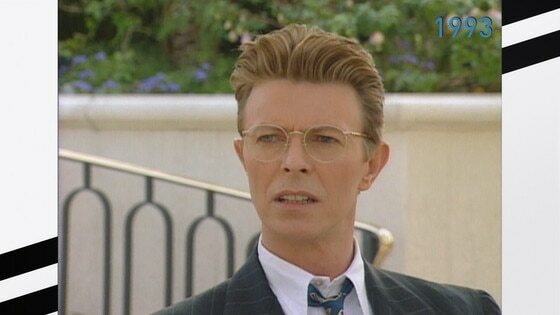 News, saying, "We are deeply saddened by the loss of David Bowie. It was an honor and a privilege to release his music to the world." The Recording Academy also issued a statement Monday, saying, "David Bowie was truly a Renaissance man and visionary artist with extraordinary talent as a singer, songwriter, performer, actor and producer, and was a musical hero to millions. A Grammy Award Winner and a Lifetime Achievement Award recipient, he is remembered and celebrated today for his audacious approach to pushing creative boundaries and ability to reinvent himself time and time again, changing the course of pop music in the process. David was a true original who influenced so many and his art will live on forever. We offer our sincere condolences to his family, friends, creative collaborators and to all of David's fans across the globe." A creative genius and influence over us all.. Rest In Peace STARMAN ?? Everything seems terrible and awful and were over here hurting but I am thankful you are out of pain. I love you so much. Thank you for make in me feel like i am never alone when I'm crying over silly things. Thank you for your photo shoots and your face paint. Thank you for Space Oddity which made me feel a lot less scared about fame. Thank you for being you and being free. This one hurts, and we miss you, but you are free. I love you. This man shaped my heart and soul. There will NEVER be another like him on this stupid planet. Take a look at the law man beating up the wrong guy. Bowie was the greatest. This is sad. The fearlessness in your artistry will be missed. ?? ?And we'd talk with our eyes / Of the sweetness in our lives / And tomorrows of rich surprise / Some things we could do.? I don't know where you're going from here but I know it won't be boring ? Thank you for the inspiration. For showing the world that it's more than okay to be exactly who you are, and live your creative expression. Thank you. #Bowie #StarMan Chase and love your own stardust, y'all. That's my #MondayMantra this week. ?? "I don't know where I'm going from here, but I promise it won't be boring." You changed the world and will continue to do so. Thank you for your life. The greatest thing you'll ever learn, is just to love and be loved in return - David Bowie #Starman ?? We will miss you on earth, but the night sky will be forever brighter. Thank you for sharing your immeasurable talent with us. #rip the innovative David Bowie. Space Oddity is one of my favorite albums that my mom introduced me to. Heaven just got a little more colorful and a whole lot cooler.